Keno has been a staple in brick and mortar casinos for decades, but online keno has taken the game off the sidelines and elevated it for players around the world. Not everyone comes to the casino with a strategy in mind. Many really don’t mind offering their money up to luck. For those players, games like keno can be both exciting and rewarding because the game is incredibly easy to learn, play and follow. Keno is often compared to both the lottery and to bingo, so players of those games will likely enjoy keno too, though it has its own unique set of rules. The most distinctive feature of keno when compared to other similar games is that it’s actually possible to win some online keno games by losing, but more on that later. Classic keno games use a format similar to the one utilized in bingo. That is, numbered balls are drawn from a container to determine winners. That’s where the similarities between the two games end, though. In keno, prior to every round or “race” players purchase a ticket with anywhere from 1 to 20 spots of their own selection. Players can purchase a whole book of the same ticket, can purchase several different tickets for one race, or can purchase a different ticket for each race. Though the premise of the game remains the same, this allows the bettors to keep things interesting. At the larger live keno games, real ball blowers (called “rabbit ears”) and cages are still popular because of the excitement they create, but in online keno the numbers are selected by a program known as a random number generator. Random number generators may still be represented by an animated ball draw, or online casinos may simply display the numbers as they are selected. Either way, RNG software is designed to mimic the real odds offered by a live ball draw. Once the betting period for each race is over, the numbers are drawn. A total of 20 numbers are drawn from a collective of 80. 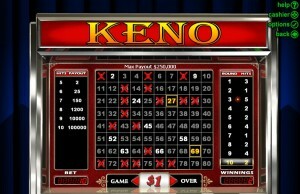 Unlike bingo, keno doesn’t require players to hit line or shape combinations, but both less and more can win. Your payout will be determined by how many spots/numbers you placed on your ticket and how many of those match up with the 20 drawn during that keno race. Obviously not every ticket will win, but not hitting many of your spots doesn’t necessarily mean you lose. Whether you hit a majority of your spots or hardly any at all, if the odds against hitting that many are high then you’ll probably earn a payout. For example, for tickets with 20 spots, casinos typically pay out for 0, 1, 2, 3 and 7-20 hits. The odds against hitting 17-20 spots are so high that all of those hits offer the same payout. To date, no one has ever hit the full 20 spots on a keno card. The good news with keno is that if you miss one race, another is sure to follow shortly after. Online casinos offering keno run literally hundreds of races a day. Most keno players enjoy the tension that comes from the draw, but the game also makes a great side diversion. Some online casinos automatically credit a player’s account for their keno wins while others require players to claim their wins. If you’re playing keno casually on the side, it’s important to know what each casino’s rules are regarding ticket claims.